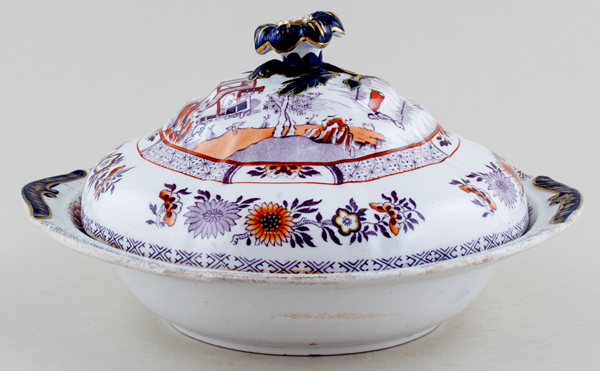 An elegant dish with beautiful flower finial on the cover highlighted with gilt. Backstamp: printed Royal Arms with Ironstone China beneath and impressed Ashworth Real Ironstone China. In script pattern number 4 over 295 The dish has wear with some discolouration in the glaze. The lid has some discolouration underneath otherwise is in excellent condition. OVERSEAS SHIPPING OUTSIDE EUROPE Owing to the size of this item a supplement of � about US$52 will be added to the standard overseas shipping charge.